Stir boiling water into dry gelatin mix in medium bowl at least 2 min. until completely dissolved. Add enough ice cubes to cold water to measure 1-1/4 cups. Add to gelatin; stir until slightly thickened. Remove any unmelted ice. Refrigerate 10 min. or until slightly thickened (consistency of unbeaten egg whites). Add strawberries; stir. Pour evenly into six dessert dishes. Refrigerate 2 hours or until firm. Store leftover desserts in refrigerator. 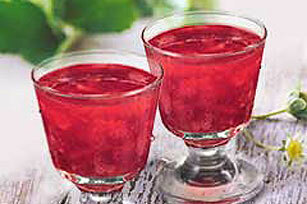 Prepare as directed, using JELL-O Strawberry Flavor Sugar Free Gelatin.